South Sudan's President Salva Kiir will sign a peace deal with rebels despite his "reservations" about it, his spokesman has assured the BBC. Rebel leader Riek Machar signed the deal last week but Mr Kiir refused. 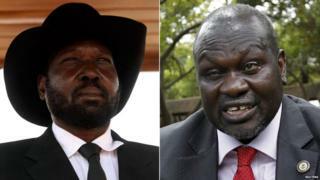 The deal is meant to end months of brutal civil war and would see Mr Machar return as vice-president. Fighting between forces loyal to the two men has displaced over 2.2 million people and the UN has warned it will "act immediately" unless Mr Kiir signs. In a Security Council briefing, the UN's humanitarian chief Stephen O'Brien warned conditions were deteriorating, saying he heard multiple accounts of atrocities, including people being burned in their homes. "The scope and level of cruelty that has characterised the attacks against civilians suggests a depth of antipathy that goes beyond political differences," he said. A US-drafted resolution would impose an arms embargo and targeted sanctions, unless Mr Kiir signs. Leaders from East African nations including Kenya, Ethiopia and Uganda travelled to South Sudan's capital, Juba, where they met President Kiir in the national palace ahead of the anticipated signing of the deal. At least seven ceasefires have been agreed and then shattered - sometimes within hours - in the 20-month civil war. The war began after the president accused Mr Machar of attempting a coup. South Sudan is the world's youngest state, having broken away from Sudan in 2011. Mr Kiir would sign the agreement on Wednesday, his spokesman Ateny Wek Ateny told the BBC - though he would also express his reservations about certain parts of the deal. And once signed, he said, the agreement - known as the Igad Plus proposal - would be implemented. "If our president signs it today we will have to implement the agreement in letter and in spirit," he said. Commission for Truth, Reconciliation and Healing to investigate human rights violations. The government does not like the idea of a third force controlling an otherwise demilitarised capital, Juba, explains BBC analyst James Copnall. It also rejects the plan to give the rebels de facto control of the three states most affected by conflict (which contain the lucrative oilfields). Meanwhile, the rebels want a dominant share in the national government, and a federal system. The signing will take place in front of regional leaders, including Kenyan President Uhuru Kenyatta and Ugandan leader Yoweri Museveni. Following Tuesday's UN Security Council briefing, the current president of the Security Council, Nigerian Ambassador Joy Ogwu, said the council was united over South Sudan. "We all agree on measures to be taken that anybody who is found culpable will be held accountable," she said. That warning was echoed by the African Union, which called on both sides to "commit to genuine reconciliation" and to "put the interests of South Sudan and its people above narrow interests". The UN has highlighted the deteriorating security, humanitarian and economic situation in the already impoverished country. A recently published report by UN experts concluded that "since April, the intensity and brutality of the violence aimed at civilians are hitherto unseen, in what has already been, without a doubt, an exceedingly violent conflict".